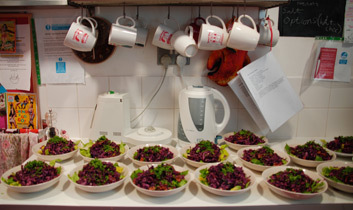 We had to show off our beautiful lunch today, red cabbage and apple salad. Made by the lovely Laura and Camilla who are doing work experience with the mail order department. There were only 15 people in the studio so there was lots to go round, which is just as well as it was scrumptious. Just in case you want to give it a try, here is the recipe: Red Cabbage Salad for 20 Red cabbage – finely grated in a food processor 5 apples – cored, quartered and grated Spring onions – all sliced Parsley – finely chopped Dried cranberries and raisins Packet of sunflower seeds 2 packets of walnut pieces Olive oil Balsamic vinegar Salt and pepper Chop all the ingredients, make a dressing out of the S & P, 5 tablespoons olive oil and 8 tablespoons of balsamic, pour dressing over salad, add the nuts and dried fruit and mix, leave to stand for 30 mins. Serve with some green cos lettuce. Enjoy!